I was recently contacted by Voyageur Press to review 3 Brian Soloman authored books. The first two reviews are for books initially published in 2011. The third will be published next month. Look for these reviews sprinkled in with regular dogcaught.com content. As a railfan motive power strikes me as one of the most fascinating parts of railroading. In the 1970s’s and 1980s, while in my formative years as a railfan, locomotives were very interesting to follow since most every locomotive type since the dawn of the diesel era was still on the road. Many models of Fs, Es, Geeps, Alcos, and GEs all still roamed the Northwest and made the head end of trains an interesting surprise. 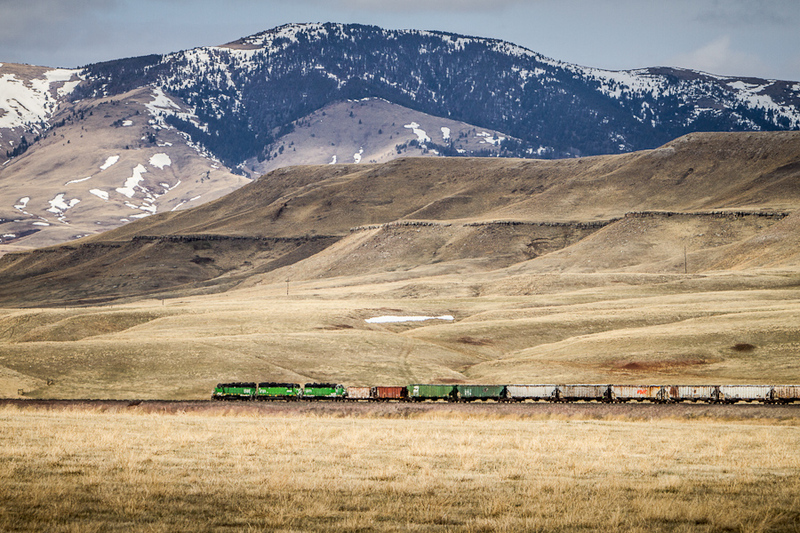 Business economics and the desire for greater efficiency changed the railroad’s philosophy about locomotives and as we moved through the 80s and 90s the great diversity of locomotives waned. Call it progress or call it a crying shame, these factors led us to the less diverse locomotive landscape we see today. Modern Diesel Power addresses diesel locomotives as they matured through the 1980s, 1990s and into the 2000s. Divided into four chapters, the book first tackles the two major manufacturers, General Electric and Electro Motive Division. In these chapters Brian Soloman details the freight locomotives GE and EMD turned out during this period covering the major models, design considerations, and technological improvements. In the final two chapters Mr. Soloman looks at Passenger Locomotives and Switchers. These are both unique sub categories of modern locomotives thanks to the variety of locomotive designs and features which are unique to particular railroads, lines, or locations. In the passenger chapter the development of the GE and EMD products are discussed as well as Motive Power’s latest offerings. 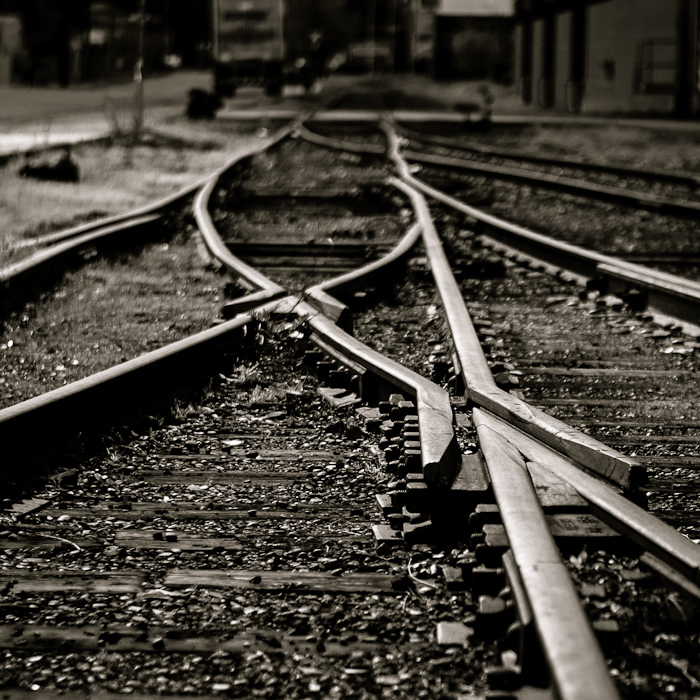 The switcher chapter primarily focuses on “Gensets” and how manufacturers are looking at the development of low emissions, high reliability locomotives which railroads can place into environmentally and politically sensitive areas to replace older less efficient units. I found the organization of each chapter pleasing and easy to digest. At the beginning Mr. Solomon provides several pages of general overview covering the major models and their design characteristics. Once the main text body ends the details begin! As the chapters transition to a photograph oriented structure, detailed captions hold many additional details describing some of the most unique developments or one-off items. In a sense it is like taking a stroll through a railroads back lot looking at their collection of locomotives and having someone explain all the unique variations in front of you. My expectation of the book was that it would contain many Brian Soloman photographs. I was truly surprised though at the sheer number which were Mr. Soloman’s. My impression is he gets around as there was almost no area of the country which didn’t have a Brian Solmoman photo! Most of the photographs are standard railfan faire, with well lit subjects and few shadows. As a documentary book these photographs fit in perfectly and provide wonderful examples of the details Mr. Soloman writes about. I found a few gems in the book like Chris Guss’ flash photo of Indiana Railroad’s SD9043s and Mr. Soloman’s pan shot of a GO Transit MP40PH leaving Toronto. I thought these stood out as exceptional work. You too may find something special in the more than 200 locomotive photographs presented. To top it off the publisher saw to it that all the photographs presented were reproduced nicely and with accurate color rendition. The book is published in paperback at 6.5″ X 8.25″ with glossy pages. I think this size is just perfect to carry with you into the field and use as reference. If you prefer to digest it all at once, it is a quick read, taking me between 2 and 3 hours to read cover to cover. All four chapters combined do a wonderful job of covering the major design, efficiency, emissions, and technology improvements which have come into play in the last 30 years. If you are a locomotive rivet counter this book likely doesn’t cover all the details you want. It is not a spotters guide. However, if you are a railfan who enjoys locomotives and is looking for a handy reference this book is perfect. I grew into railranning during the period this book covers and despite feeling like I had a good understanding of all the locomotive developments over the last 30 years I learned a few things. Recommendation: Buy Modern Diesel Power if you want to understand diesel locomotive development over the last 30 years and would like a concise, well illustrated reference. Modern Diesel Power is available for purchase on the Voyageur Press website, Amazon, and Barnes and Noble. It is also available as an e-book! Back to my mid-April visit to the Gorge. As I mentioned in my previous post I was up early so I’d be in position for sunrise at tunnel 2 east of Cooks. I was there on time and my first train passed at 6:45, literally 2 minutes after the sun popped over the horizon and came up over the only cloud. Too bad it was a westbound. Fortunately there was a train in the Cooks siding waiting to head east so I’d have perfect fodder in just a few minutes. While waiting for the eastbound to arrive I had a nice conversation with a native who was minding his fishing rig below the hill. He was very curious what I was up to and wanted to make sure that I wasn’t going to steal his fishing gear. Once he saw the camera gear he realized I was another railfan and we ended up having a nice conversation about railfanning and the number of trains that pass through the gorge. He went to his rig and retrieved a fish before he headed on his way. 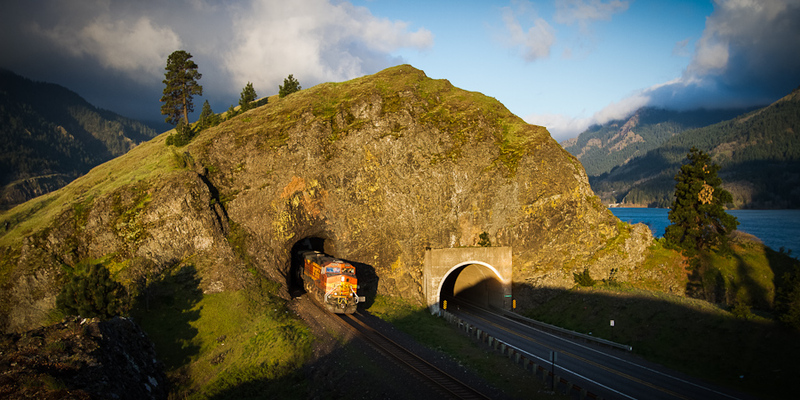 At 7am the eastbound was finally out of the siding and popped out of the tunnel into the morning rays. Well worth the effort to get up early. Next time I’ll have a few photos from around Maryhill which include a snow capped Mt. Hood…. 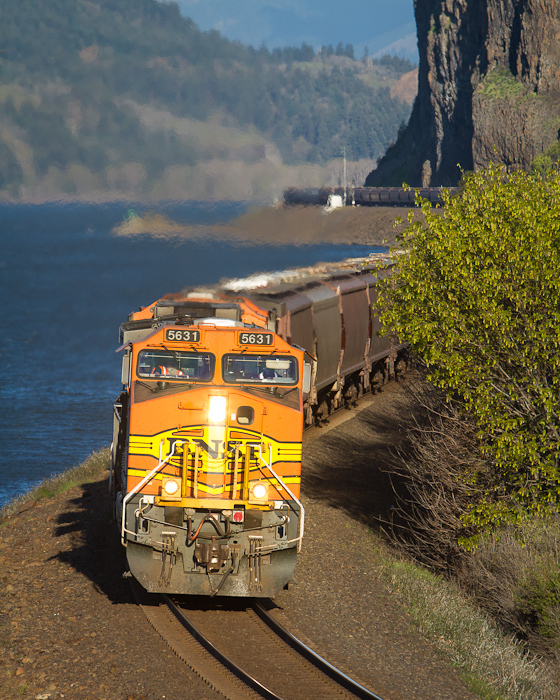 On the 14th I spent an impromptu day in the Columbia River Gorge watching trains and hanging out with some friends. I decided to make a full day of it so I was up at 4 and on the road at 5. My goal was to be at tunnel 2 east of Cooks when the sun came up and my timing was impeccable as I was able to sit on the shore of the mighty Columbia and watch the sun pop over the mountains to the east. It was a beautiful morning…as long as you could stay out of the wind. I fought hard to keep everything on the ground while perched up on the rock just east of the tunnel. Brutal. I captured three trains there but I’m not quite ready to share those images just yet. I followed the last eastbound to Bingen where it met a manifest. A 10mph slow order and the slow down for the meet allowed me to get ahead to capture the image above of the train winding around the rocks and across the Locke Lake fill. These guys were in a hurry to get to Lyle to meet the Builder so I let them go about their business and found a place to photograph 27.